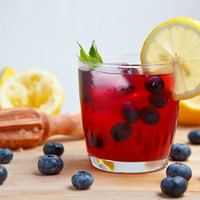 No nonsense sweet blueberry lemonade. Shake and vape. Optional 2 drops koolada per 30ml or to taste. This recipe is the property of LocoMojo and released under the CC Attribution-NonCommercial-Sharealike 4.0 license. You may not copy, derive or commercialize this recipe without following the terms of this license or the explicit permission of the creator. Well this recipe sure made my heart feel alive. Very delicious vape. Out of the ordinary as far as I'm concerned. Blueberry lemonade is just not really a popular thing although it should be. As Vurve said, sweet, tart..Idk about bitter because to me FA Black Currant isn't really that bitter. Its rather bright and candy-like, which really make a good combo accenting the blueberry. I felt it was actually pretty overpowering on the SNV. I would've brought Black Currant down to 0.5% personally, because it does take over the blueberry right away even being one of FA's weaker flavors. Either that or bring the blueberry up a bit. All the lemons in this are trying to make that blueberry bright and the black currant is banging it back down, which is perfect but I just think it went too far. Being incredibly familiar with FW Blueberry, I was searching for it, but all I could find was that damn black currant lol. Anyways, besides that little subjective concern, the vape is great. It's smooth, sweet..easy to vape. It has just the right amount of tartness. I can vape it constantly. Good job man. This is a really great recipe. A wide range of flavor profiles to create a satisfying vape experience. Sour, sweet, bitter, tart. The FA black currant is rather bright and bitter, but provides an additional level of dark berry that pairs with the FW blueberry very well. Though the TFA sweetener does a sufficient job of bringing down the bitterness of the FA black currant, I found myself instead wanting to offset this with a nice bright berry, such as TFA Wild Blueberry or TFA Strawberry Ripe. This would help cut the bitterness of the black currant without cutting back the lemonade flavoring which seems sensitive to sweetener. On a side note, I mixed a side batch with INW Black currant and it's a much more mild black currant with subtle creamy texture. It kinda strayed from lemonade, but is super delicious and adds an extra component to the recipe while keeping everything in balance.